Last September 18, 2007 at Rockwell Tent, Metro Magazine (ABS-CBN Publishing) and Samsung Mobile presented METROWEAR RETAIL (The fifth show of the Metrowear Series) the latest collections of well renowned Filipino Designers for local retail fashion houses: Folded and Hung, Pink Soda, Apple and Eve, Details, Graxie, Ilaya Couture, K & Company, Kaiser, Maud and Religioso. They gave away Samsung mobilephones to two lucky raffle winners. Metrobank gave this lady with a Metrobank Femme Visa (CreditCard) loaded with PhP 5,000.00 worth of credit. 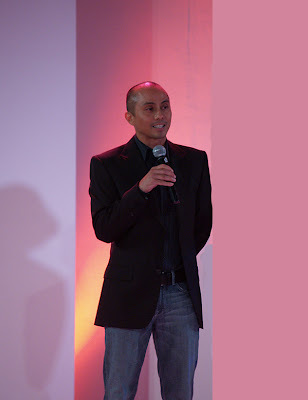 Ernie Lopez - President, ABS-CBN Publishing gave a brief introduction and welcomed the guests.